Peel, seed, and chop the tomatoes. Set aside. Peel and cut the onion and carrot into small dice; peel and chop the garlic very fine. Place the onion, carrot, and garlic in a nonreactive soup pot with some olive oil and a splash of water; cook until translucent. Add the bay leaves, drained beans, and prosciutto or bacon, and cook for a few minutes more. Add the tomatoes to the beans and stew for another minute or so. Pour in the stock and bring the soup to a boil. Lower the heat to a simmer and cook for about 1¼ hours, stirring occasionally. Add the salt after about an hour. The beans should be fully cooked, soft but not falling apart. Add the greens, washed and cut into 1-inch strips, and simmer, uncovered, for another 20 minutes, stirring occasionally. Meanwhile, heat some olive oil in a small frying pan. Fry the sage leaves in the oil for a few seconds, a few at a time (more than a few seconds and they’ll turn black). Drain on a paper towel or absorbent cloth. 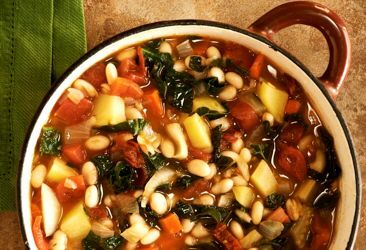 When the soup is done, ladle it into soup bowls and serve, garnished with a few shavings of Parmesan and the fried sage leaves.